Karen Kay works with the fairies and angels every day from her home in Cornwall in the United Kingdom. She hosts fairy themed events, including the 3 Wishes Fairy Festival and the Avalon Fairy Balls and Fairy Fayres which are held in mystical Glastonbury. She first started organizing events back in 1994 after receiving divine guidance. She also hosted the UK’s first Angel Conference in 1999. She is a certified Fairyologist and Realm Reader, and has produced several guided meditation CD’s, as well as fairy inspired songs and music which she creates with her partner, Michel Tingle. 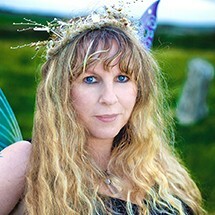 Karen is also the editor of her own fairy lifestyle magazine, called ‘FAE', which stands for Faeries and Enchantment. Her earliest fairy-related memory was from her grandmother’s garden, where she discovered the flower faeries, and learned how to make fairy perfume from rose petals.